Mirrors are popular decor elements in living rooms and bedrooms, so why not kitchens? The element of surprise alone adds personality, while the reflective qualities make the kitchen appear roomier. Shadows from cabinets create pockets of darkness that can be dreary. Under-cabinet lighting improves the ambiance while serving a practical purpose of making it easier to see when you're working. Puck lights, tape lights and rope lights are great options that are easy to install without making any permanent changes. Kitchen floors don't have to be boring. Area rugs and runners are perfect for introducing a vibrant splash of color. You may be surprised at how much a kitchen can be transformed with this simple addition. Bring nature indoors with a green plant atop a breakfast bar, kitchen island or refrigerator. 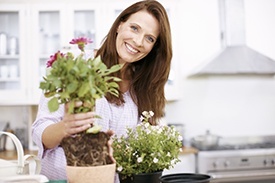 Did you know that studies by NASA show that many types of houseplants help to purify indoor air? Use tension rods (like the ones that hold shower curtains) to hang spray bottles under the sink or keep cookie sheets, pot lids and other items organized. Lazy Susans and pantry risers keep canned goods and dry groceries from getting buried at the back of the cabinet. If you have space above the cabinets, use attractive wicker baskets to store infrequently-used items. Take advantage of vertical space by hanging a spice rack, small shelf or magnetic knife holder. In addition to being functional, today's countertop appliances are sleek, shiny works of art. Versatile items like blenders, slow cookers and coffee makers are time and money savers. What's the one kitchen item you can't live without? Let us know in the comments!